The E-flite® UMX™ Cirrus SR22T offers the pilot a flying experience that is as good as the original and more fun than you can imagine, thanks to modern technology and exciting performance. This Bind-N-Fly® Basic model features a Spektrum™ 2.4GHz DSMX® receiver with built-in AS3X technology (artificial stabilisation over three axes) which behind the scenes compensates for the effects of external influences such as wind or turbulence and gives you the feeling of flying a much larger model. If you are a relatively new pilot or just want additional safety while getting to know your new model, you can switch on the optional SAFE® Select flight support, which is also built into the receiver. Based on original Cirrus Aircraft CAD plans, the UMX SR22T perfectly captures the elegant lines of this modern wonder and enables a flying experience that will do justice to the best-selling single engine aircraft. The powerful 3600Kv brushless motor delivers outstanding performance when using one of the recommended LiPo flight batteries with 2S and 180-300mAh. The true to model spinner and 3-blade propeller underline the sleek lines and deliver impressive thrust for an exciting performance spectrum. 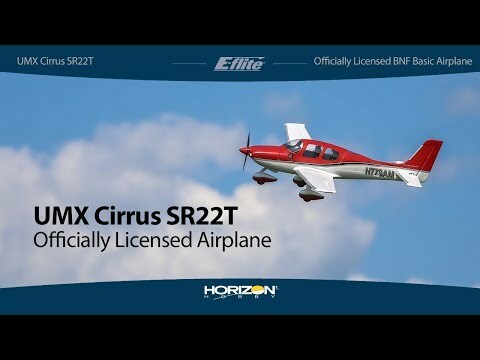 Das Produkt CIRRUS SR22T UMX BNF BASIC MIT AS3X von E-FLITE in der Kategorie Sport & Scale Airplanes hat eine Spannweite von 732mm sowie ein Gewicht von approx. 120g. Die Steuerung des Modells erfolgt über die Funktionen E,R,A,M. Das Modell ist als BNF - BIND N FLY ausgeführt und ist für Fortgeschrittene geeignet. Die Fertigstellung des Modells ist für Modellbau-Einsteiger ohne Vorkenntnisse einfach möglich. Wir empfehlen einen 180-300mAh 2S 7.4V LiPo JST-PH Akku für dieses Elektroflugmodell. E-Flite is a Horizon Hobby brand that specializes in RC Helicopters and RC Airplanes. They offer BNF (Bind and Fly), PNP (Plug and Play), and ARF (Almost Ready to Fly) Models, all with top quality. In the RC Helicopter division, is their very popular and award winning Blade series (available in many different size categories). In the RC Airplane division, customers praise over the UMX (Ultra Micro) Models.